Mame draws her inspiration from the paradigm that each person holds the potential to contribute to progress. She plans to use her energies to give each and every one of her beneficiaries a second chance with which to rebuild their lives and become fully engaged citizens. Social entrepreneur, activist for women’s empowerment and youth participation, Mame is passionate about social justice and cultural diversity. Since 2004, she has been wholly dedicated to the management of Solidarité Active, through which she developed and led many programs. 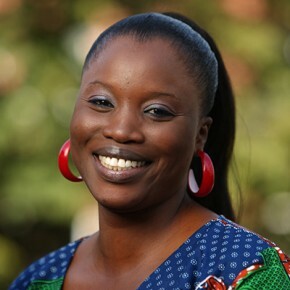 In 2002, she founded the Organization for Children and Teenagers in difficulty, later renamed Solidarité Active (Active Solidarity), a Senegalese organization to reintegrate women and minors who are victims of social exclusion, and to promote girls’ and women’s leadership. Solidarité Active was chosen by UN-Habitat to be a benefactor of the UN-Habitat Fund for Urban Youth in 2011. Since her childhood in her native region Thies, in the City of Tivaouane, Mame has been engaged in community development, and during her college and university years, she coordinated the Club “Education à la Vie Familiale (EVF), a program of the “Groupe pour l’Etude et l’Enseignement de la Population”. Having obtained a Baccalaureat in Human and Social Sciences at Tivaouane College, Mame moved to Dakar to pursue studies in English at Cheikh Anta Diop University. Afterwards, she pursued a Bachelor’s degree in Business Administration with a focus on Communications and Organization. She also obtained certificates in Leadership, Project Management, and Social Entrepreneurship, respectively from Collège Cambodge, UN – Habitat, and the International Organization: Francophonie. In 2010, Mame was named one of the 100 top Francophonie young leaders. As a result of this honour, she was invited to participate in the third Francophonie Summer School. In 2012, she was designated Ambassador of Goodwill by the Directorate of prison of minors in recognition of the work of social reintegration for children in conflict with the law. Mame is actively involved in promoting the rights of youth and women in her native Sénégal and throughout the region and has represented West Africa in the International Youth Parliament. She is also the point person for the West African Youth Network in Sénégal. She has participated in numerous other activities on peace building and conflict resolution in Africa. Professionally, she administered the Foundation for Youth Employment of the Movement of Senegalese Businesses. In this capacity, she organized two editions of the Forum for First Employment of Sénégal. After her year in the Sauvé Scholar Program, she returned to Sénégal to start the “Second Chance Academy” and the Solidarity Guarantee Fund that were her Sauvé projects; also, inspired by her research on social economy and social enterprise, she launched a Social Shop that helps to sell products from program participants. As a Sauvé Fellow, Mame developed and finalized her project “Second Chance Academy,” enabling women, youth and other marginalized segments of society to access education programs, professional training and social reintegration. Mame brought an innovative aspect to her project by establishing a common guaranteed fund, which allows women and youth to obtain bank credits and start their own businesses. This is an essential step towards fulfilling her dream of creating a social enterprise, and was possible because she undertook comprehensive studies and research on the functioning of the social economy and social entrepreneurship at both McGill and Concordia Universities. In March 2013, she participated in the UN Commission on the Status of Women in New York, and proudly participated to the peaceful protest on 8 March 8 in Manhattan to denounce violence against women and gender discrimination. She undertook a rigorous professional development program over the course of her Sauvé Year. She earned certificates in Leadership and Embracing Diversity as well as in Social Psychology and Public Relations from Concordia University. Mame reflects that as a Sauvé Fellow, she experienced a new level of cultural diversity. She left Sauvé House with a new perception of – and appreciation for – human differences. She summarizes her experience in residence as follows: she had lots of fun with a “new family”, she learned about reaching her goals, and she had the opportunity to share the values and charms of her culture with others while learning about the charms of other cultures. In November 2014, Mame returned to Montreal, McGill and Sauvé House to attend the intensive Executive Training course, International Development: Bridging the Worlds of Theory, Policy and Practice at the McGill Institute for the Study of International Development (ISID). During her stay in Montreal, she also participated in the program of the Jeanne Sauvé Annual Address, thanking the speaker, Mme Céline Galipeau, on behalf of the Jeanne Sauvé Foundation. In May 2015, Mame was awarded an Alumni Collaboration Fund grant (alongside her project partners, Sauvé Fellows Özlem Elgün Tillman and Tairah Firdous) to help fund the creation of an international women’s network that will generate dialogue around gender equality and female empowerment. Sauvé Fellow Presentation report: Mame Ndiaye on empowering women through social entrepreneurship and the social economy.